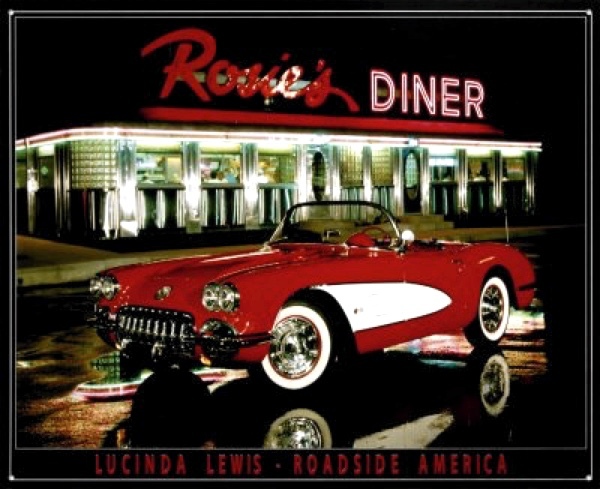 LUCINDA ‘CINDY’ LEWIS is an American photographer, well known for her dramatic pictures of auto-Americana, especially cars pictured against classic roadside scenes. Mat Irvine: Round 2 has issued two 1:25 scale AMT car kits in its Car Culture Series, both featuring Cindy Lewis pix. The kits are of 1957 cars, so nicely match the high style retro-era of the buildings and surroundings. AMT 1957 Chevy Bel Air (below) ‘molded in red’ version. The subjects of this creative tie-up are a 1957 Chevrolet Bel Air and a 1957 Chevy Corvette, and both kits include card dioramas with Cindy Lewis photos as backdrops. The side panel of the Bel Air box (below) shows Cindy Lewis photographs of 1957 Chevrolets. The car kits are both relatively recent, so the Corvette has a separate chassis and full underside detailing, while the Bel Air is the second 1957 version, AMT having made two different kits. There’s a choice of plastic too, though you have to buy one kit per colour. Each new Car Culture kits is each available in two colours, both cars come in white, the Bel Air also having a red option, the Corvette an aqua moulding. Unassembled Bel Air diorama base (below) features the Golden West Motor Lodge as a backdrop. The Cindy Lewis pix offer some interesting and relevant background information. The Corvette is shown parked outside the Gardenway Motel, Villa Ridge, Missouri, the Bel Air outside the Golden West Motor Lodge in Reno, Nevada. Sad to say, both establishments have suffered the fate of a great deal of roadside America. The 1957 Chevy Corvette Convertible (below) ‘molded in white’ version. The Gardenway Motel, featured on the Corvette diorama base (below) closed in October 2014, though the building still seems to be standing. It was a classic Route 66 motel with an equally classic neon sign standing outside. The Golden West Motel Lodge has completely gone. Having been been closed for many years, it was finally demolished in late 2016. One bright spot is that the neon signs were saved. The Cindy Lewis book Car Culture Classics Volume 1 features a 1958 Corvette (below) which was the first year of the twin headlamp design, though it is classed as a C1 body style. The C2 arrived in 1963, with the first Sting Ray. Fortunately, not all classic-retro American motels have been razed to the ground. For example, the Munger Moss Motel, just off Route 66 in Lebanon, Missouri, has been renovated. Car Culture Classics: Chevrolet Bel Air by Lucinda Lewis shows the same photograph used on the AMT box. 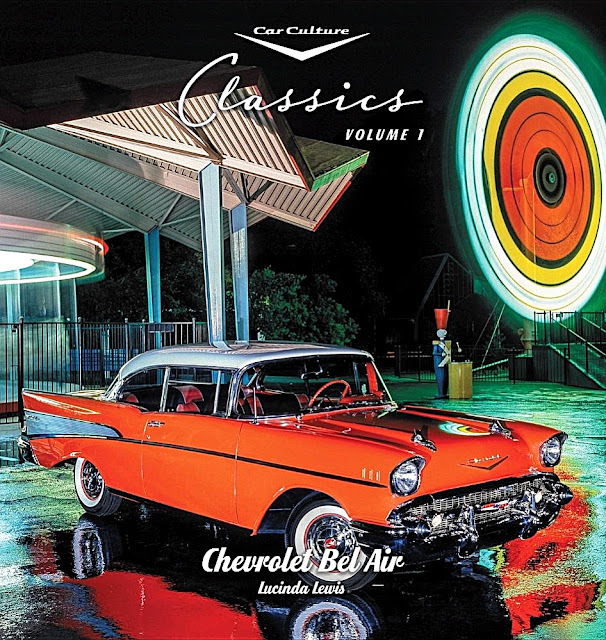 A flyer for Car Culture Classics: Chevrolet Bel Air is included in the kit box. An interesting partnership that, because of the Lucinda Lewis pictures, breathes new life into two existing AMT kits. Both models assemble easily, and look good when finished. The card backdrop adds a big sparkle to each finished car, and provides a fine excuse to talk 1950s-era automania with fellow car buffs.